A visitor walks past Gulfstream business jets at the Asia Business Aviation Conference & Exhibition in Hong Kong in Feb. 2007. Crisscrossing the country in corporate jets may no longer fly in Detroit. But the coveted executive perk has hardly been grounded on Wall Street. NEW YORK - Crisscrossing the country in corporate jets may no longer fly in Detroit after car executives got a dressing down from Congress. But on Wall Street, the coveted executive perk has hardly been grounded. Six financial firms that received billions in bailout dollars still own and operate fleets of jets to carry executives to company events and sometimes personal trips, according to an Associated Press review. The jets serve as airborne offices, time-savers for executives for whom time is money — lots of money. And some firms are cutting back, either by selling the planes or leasing them. Still, Wall Street's reliance of the rarified mode of travel has largely escaped the scorn poured on the Big Three automakers. Insurance giant American International Group Inc., which has received about $150 billion in bailout money, has one of the largest fleets among bailout recipients, with seven planes, according to a review of Federal Aviation Administration records. "Our aircraft are being used very sparingly right now," AIG spokesman Nicholas J. Ashooh said. "I'm not saying there's no use, but there's very minimal use." To cut costs, AIG sold two jets earlier this year and is selling or canceling orders for four others. Five other financial companies that got a combined $120 billion in government cash injections — Citigroup Inc., Wells Fargo & Co., Bank of America Corp., JPMorgan Chase & Co. and Morgan Stanley — all own aircraft for executive travel, according to regulatory filings earlier this year and interviews. A cross-country trip in a mid-sized jet costs about $20,000 for fuel. Maintenance, storage and pilot fees put the cost far higher. Many U.S. companies are giving up the perk. The inventory of used private jets was up 52 percent as of September, according to recent JPMorgan data on the health of the private aircraft industry. A few big U.S. companies have shunned jet ownership. Chip maker Intel Corp., for example, requires executives and employees to fly commercial. Intel occasionally charters jets for executives on overseas trips for security reasons, though. For automakers, the public relations nightmare exploded last month when the chief executives of Ford, GM and Chrysler were criticized for flying on corporate jets to Washington to ask Congress for federal bailout money. "Couldn't you all have downgraded to first class or jet-pooled, or something, to get here?" Rep. Gary Ackerman, D-N.Y., asked the CEOs. When the executives went back to Capitol Hill two weeks later for a second round of hearings, they traveled by car. So why were Wall Street executives spared from the corporate-jet backlash? One reason is that they didn't have to go before Congress to request bailout money, so no one asked how they traveled to Washington. Has a wholly owned subsidiary, Citiflight Inc., that handles air travel for executives. Citi spokeswoman Shannon Bell refused to comment on the size of the firm's fleet but said it has been reduced by two-thirds over the past eight years. FAA records show four jets and a helicopter registered to the company. In 2007, then-CEO Charles Prince used company aircraft for personal trips for security reasons. Those trips cost the company $170,972 for that year. Current CEO Vikram Pandit began reimbursing the company for all personal travel on company planes since being appointed in November 2007. Use of Citigroup's aircraft currently is confined to a "limited number of executives," Bell said. "Executives are encouraged to fly commercial whenever possible to reduce expenses." Has reduced its executive jet fleet size from three planes to two since 2005, company spokesman Mark Lake said. FAA records show two Gulfstream G-Vs as registered to the company. In 2007, CEO John Mack's personal use of company aircraft totaled $355,882, according to a February proxy filing. Mack is required to use company aircraft for personal trips for security reasons. Registered as the owner of four Gulfstream jets, including a 2007 ultra-long range flagship G550 model, FAA records show. A G550 ordered for delivery that year would have cost roughly $47.5 million. CEO Jamie Dimon is required to use company aircraft for personal trips; In 2007, his personal use of company jets totaled $211,182, according to a May filing with the SEC. Company spokesman Joe Evangelisti refused to comment on whether the bank has changed its policy on corporate aircraft use since accepting $25 billion in TARP money. Registered as the owner of nine planes, including four Gulfstreams, FAA records show. Company spokesman Scott Silvestri refused to say whether the company has changed its policy on corporate aircraft use since taking $15 billion in bailout money. CEO Kenneth Lewis, also required to use company aircraft for personal trips, racked up $127,643 in such travel last year, according to a March filing with the SEC. Owns a single jet that "is strictly for business purposes under appropriate circumstances," spokeswoman Julia Tunis Bernard said. "No (government) funds will be used for corporate jet travel," she added. SEC rules require publicly held companies to disclose executives' personal use of corporate aircraft. But there's "a lot of gray area" in how they do it, said David Yermack, a finance professor at the Stern School of Business at New York University who has studied the matter. "If you use the plane for a personal trip but make one business call, should you report it?" he said. "Or if you're playing golf with potential business partners, does a company report that as business or personal?" As mounting losses force companies to cut costs, some are becoming stingier about personal use of the company plane. Merrill Lynch & Co., for example, has banned such trips, according to company filings. Experts say other companies that took bailout money will probably follow suit. "The personal use of these planes is virtually indefensible at this point," said Patrick McGurn, special counsel at shareholder advisory firm RiskMetrics Group. "Once you're on the federal dole, the pressure is going to become immense on these firms to cut these costs." 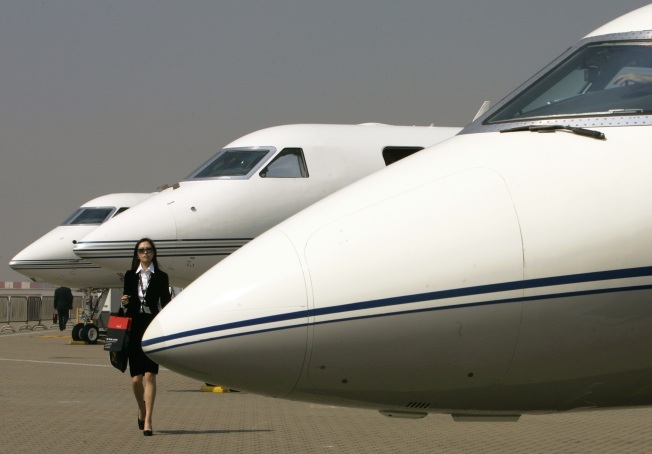 Private jet manufacturers say the debate over executive travel has been overblown. "What people don't understand is that business jets are mobile offices," said Robert N. Baugniet, Gulfstream's director of corporate communications. "If time has any value to you, then you'll understand why people use business jets." He said the dustup hasn't hurt orders for new planes. Still, some firms have avoided corporate jet ownership. Goldman Sachs Group, whose executives in past years have been among the highest-paid in the industry, has never owned its own aircraft since going public in 1999, spokesman Michael DuVally said. The company does make private planes available to some executives through a fractional jet agreement, a timeshare-style arrangement, according to filings. Duvally refused to say how much the company spends on its fractional agreement. Wary of being perceived as opulent, most companies fly in unmarked jets. Aviation buffs can usually track planes over the Internet using aircraft tail numbers. But many companies, including AIG and Citigroup, have blocked the public's ability to do so for security reasons. Some corporate chieftains make no excuses for flying the private skies. After years of railing against such costs, billionaire investor and Berkshire Hathaway Inc. CEO Warren Buffet broke down in 1989 and bought a Gulfstream IV-SP using $9.7 million in company funds. He named the aircraft "The Indefensible."